For a recent project, I needed several zener diodes and I discovered that I did not have any device to test them. A recent issue of SPRAT (nr.146, spring 2011) contained an article by Richard Wilkinson, G0VXG. 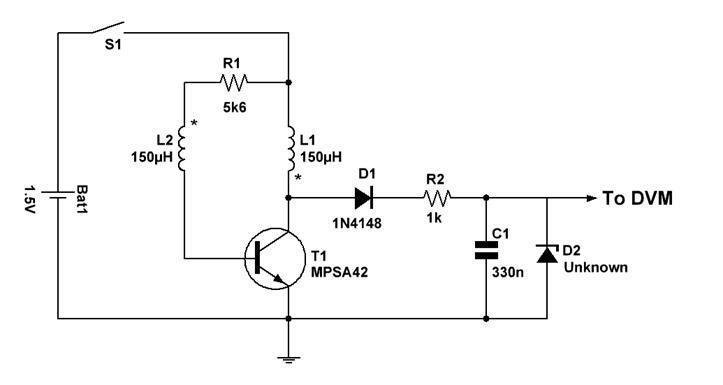 The tester which he proposes is based on a simple oscillator which acts as a DC-DC converter. L1 and L2 are bifilarly wound on a ferrite toroid. Richard used 20 turns on a FT50-43 core. I used a dual choke salvaged from a discarded switching power supply. For T1, Richard used a 2N3904 which isn’t quite safe as it cannot handle more than 45 Volts. For this reason, I have employed a MPSA42 high-voltage transistor. Capacitor C1 should have a working voltage of 100 V.
If no zener (D2) is connected across C1 and S1 is switched on, the output rises rapidly to 45V DC. This voltage can be measured with a DVM. When an unknown zener is connected across C1, output will be equal to the zener voltage. If a normal diode (or a zener diode with zener voltage > 45 V) is hooked up, the DVM will measure 45 V.
(even lower if the diode is a germanium or Schottky type). Resistor R2 limits the current through the zener diode to a safe value. but 1W or 5W diodes will give readings which are (about 5%) too low. No big deal. The circuit draws about 20mA from a single 1.5V battery. I have used it for about half a year now and it works quite well. A plastic box which had contained beef cubes (Aldi supermarket) was a proper housing for this circuit.